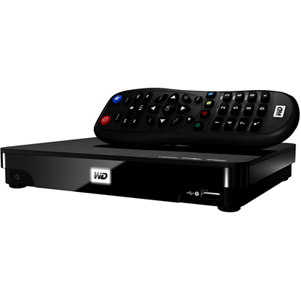 The Popcorn Hour A-400 TV media player is a good performing and affordable media streamer. As a family tradition, my husband and I like to buy a family gift that gets opened Christmas morning. My kids love the tradition, wondering with great anticipation what awaits them under the tree. In past years, there’s been a trip to Disney, bikes and skis. This past year, it was a home entertainment system with a big screen HDTV. We love the big screen TV, so much so that we want to enhance our viewing options. We headed to our local electronics store to browse our options and that is where the Popcorn Hour A-400 TV media player caught my eye. The name itself evokes a movie theater experience, since when my family sits down to watch a movie or television show, a bowl of popcorn is usually involved! But the Popcorn Hour A400 delivers in performance, too. 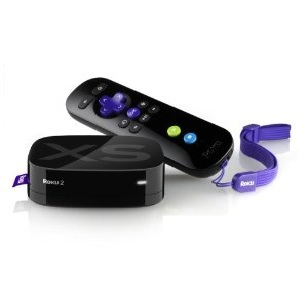 This device streams a wide assortment of multimedia options: movies, TV, music, your saved media files, you name it. Plus, it’s one of the few streaming players that supports 3D Blu-Ray, which, if you have a big screen HDTV, you’re going to want a stream with 3D Blu-Ray capabilities. The viewing experience is simply phenomenal! To separate itself from other streaming TV media players, I love that Popcorn Hour calls its digital home entertainment device a media jukebox because it better reflects all the media possibilities that can be streamed. The company makes it clear that its media player allows all your digital devices to talk to one another, so there are no barriers to deal with between your TV and the Internet, personal computers, smartphones, tablets and digital storage devices when it comes to accessing programming, music, videos, photos, or whatever media file you may have stored on these devices.The setup process is a bit more involved than other TV media players simply because you are setting up more comprehensive network controls for sourcing, managing and watching movies, stored photos, music and any other type of media that you play on another device but can now watch or listen to on your HDTV as well. Despite its complexity, I found the setup process easy to follow, thanks to the clearly written and illustrated user manual that comes with the streamer box. However, there were parts of the setup that were slow or returned error messages. But I found the troubleshooter section in the setup guide, as well as customer support, very helpful. The back of the Popcorn Hour networked media jukebox holds all the connection ports you need to complete the setup. In getting started, you have the option of connecting to your TV via an HDMI cable, composite cables, or component cables. Your selection depends on which terminal connection your TV is equipped with. All the necessary connection outlets can be found on the back of the streaming player. Once you have your TV and the Popcorn Hour A-400 Networked Media Jukebox connected to each other and a power source, you’re ready to turn everything on and be introduced to the Quick Setup Wizard. The wizard takes you through all the necessary steps required to ensure your Popcorn Hour streaming media player works properly in all applications. The wizard supports all languages, so just select the one you want for your user interface. While using the wizard, I established the Internet connection (wired or wireless) that I will be using with the media streamer and set the time, weather, parental controls and advanced settings, such as network share, subtitle languages, video/audio output, screensaver time and other preferences. The remote control that comes with the Popcorn Hour media player is nicely equipped with all the necessary functions that make navigating around the streamer quick and easy. And kudos to Popcorn Hour for making it a backlit remote! The remote features an alphanumeric keypad and a directional buttons pad, as well as various function buttons, like Power; TV mode; Setup; A-B/Home to access the main menu or the apps market; Delete; Caps/Num; Time Seek; Return; Source; Enter; Info; Stop; Page Up/Volume Up; Page Down/Volume Down; Play; Pause; Mute; Rewind; Fast Forward; Previous; Next; Title Menu; Repeat; Slow; Angle, which switches the camera or viewing angle during DVD playback; Audio; Subtitle; and Zoom. Since I also attached a CD and DVD player to my Popcorn Hour A-400, I found the DVD Menu and Eject button extremely useful when using the disc player. The Home screen of the Popcorn Hour TV streaming media player is your starting point to access programs or media content from other devices. Anything you want to do on the Popcorn Hour A-400 Networked Media Jukebox starts at the Home screen. 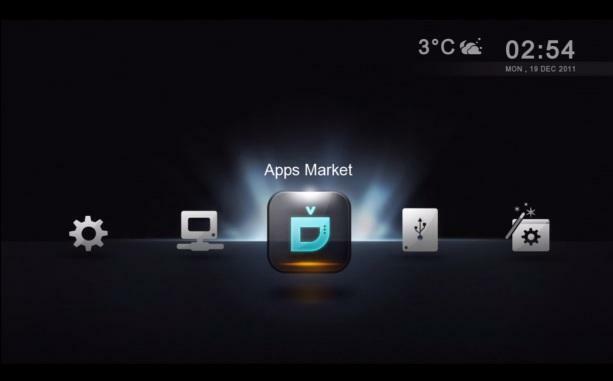 It’s a nice, basic, uncluttered Home screen layout that displays the icons needed to access TV programming, the Apps Market and content from a local source, such as an internal hard drive or USB. The Apps Market will most likely be the most used “channel.” It’s where you access free or fee-based apps for video on demand services, games, online radio, social networking, etc. Popcorn Hour did a nice job categorizing apps into geo-specific content. I also found the offerings adequate, with new multimedia offerings added frequently. 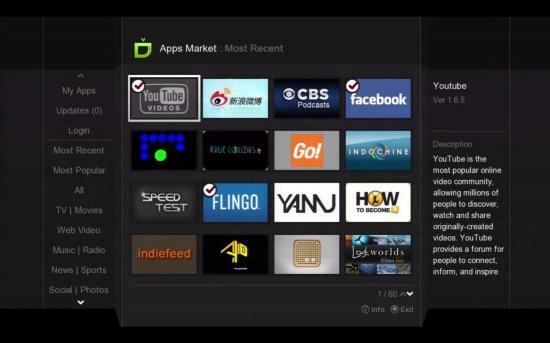 The Popcorn Hour Apps Market is where you access free and fee-based movies, TV shows, music and other programming. Whatever you play on your Popcorn Hour A400, you will find the HD picture quality outstanding and the performance of the unit fast and highly responsive. The Popcorn Hour A-400 Networked Media Jukebox is a brand from Syabas Technology, a Malaysia company that manufactures wired and wireless digital home entertainment electronics. The streamer measures 7.2 inches wide, 6.2 inches deep and 2.2 inches high and weighs 2.86 pounds. The Popcorn Hour media jukebox is powered by a Sigma Designs 8911 dual-core 800 MHz CPU with L2 cache and features 3D Blu-Ray, a VXP video processor for enhanced video performance and Dolby surround sound. It has a 512MB DDR2 memory and an Adobe Flash based user interface. 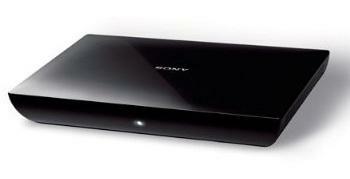 It is equipped with Network Media Jukebox software, MKV 3D codec and side-by-side video. The unit includes a network-attached storage (NAS) function with a HDD quick dock for effortless hard drive installation and removal. Connections included on the Popcorn Hour box are HDMI 1.4, composite, component, optical, and coaxial audio and video outputs, a USB 2.0 host port, an SDHC card reader. It is equipped with an Ethernet 10/100/1000 Mbps. The Popcorn Hour A400 network media player has several key features that are unique to this brand and extremely worthwhile to have. The one feature I find myself using most often is the Networked Media Jukebox (NMJ) Navigator. It’s a screen app with interactive menus for browsing your movies, television programming, music and other media collections, or sharing what you’re watching with friends on your social networking sites. 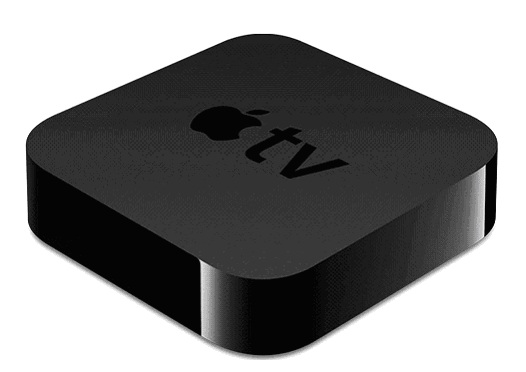 You can also use it as a soft remote so you can control the Popcorn Hour A-400 with your iPad. What’s neat about the NMJ is that you can download the poster or fanart for movies, videos and TV series so you can choose your selections using the cover art of posters or DVD covers, just like in the movie theaters. The NMJ software also creates a great interface for organizing your personal and music libraries, displaying them on your TV screen as thumbnails. This makes browsing more organized because you can search by artist, album, song title, date, etc. Some other features I use often are the NMT App, which makes the Popcorn Hour streamer function as a network attached storage device; the File Manager to manage storage device files; the Transmission Torrent Client so I can download files on my computer without the computer being on; the Flagging System to mark which videos I already watched; the Remote Control App for smartphones and tablets; and the FTP Server for transferring files to and from the media streamer. 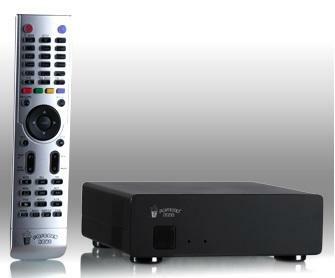 Here’s a look at what’s in the box when you purchase the Popcorn Hour A-400 media streamer. The Popcorn Hour A400 Networked Media Jukebox retails for $249, according to the Popcorn Hour website (http://www.popcornhour.com/onlinestore/). In a price comparison of other online retailers, the price ranged from $215 to $322.36. The Popcorn Hour A-400 can be purchased online directly from the manufacturer, or other online retailers, such as Amazon, eBay, or sites that specialize in electronics. 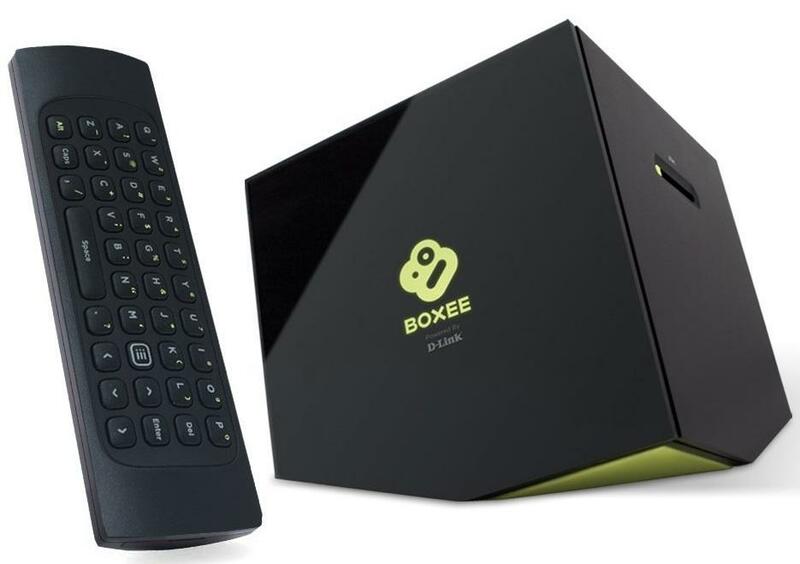 As of this writing, eBay had some of the lowest prices for the TV media player and surprisingly, Amazon had one of the highest at $322.36 (http://www.amazon.com/Popcorn-Hour-A-400-Network-Jukebox/dp/B009VB27KA). Usually Amazon is competitively priced to match or beat other online retailer prices, so be on the lookout for Amazon to lower its price for the A400 Popcorn Hour media player in the near future. Because it is a fairly new product, reviews of the Popcorn Hour A-400 Network Media Jukebox are hard to come by. I would recommend checking out forums. For example, I found discussion threads on Networked Media Jukebox (http://www.networkedmediatank.com/showthread.php?tid=63819) and AV Forums (http://www.avforums.com/forums/streamers-network-media-players/1675094-popcornhour-a400.html) regarding the Popcorn Hour A400 that were very helpful. I would also check back with Amazon, since it typically has the most customer reviews for any given product.